While Walla Walla sleeps on cold fall nights, the thought of wine grapes and the vines they hang on freezing stirs Frank Jimenez from his bed at 3 a.m.
His day will not end until 6 p.m.
Jimenez, a contracted vineyard manager, drives in the pre-dawn to various vineyards to come to the rescue, monitoring the weather and switching on wind machines to deter frost from forming on the grapes, allowing them to hang longer on the vine and develop a richer flavor curve. As the sun rises at 6:30 a.m., Jimenez is in vineyards ready to harvest with a tractor towing a bin, into which picking crews dump grapes they’ve cut from the vines. His dog Oakley, which Jimenez says “goes everywhere I go,” sprints after him. 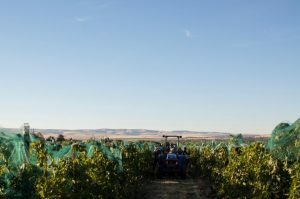 On this October morning one of the varietals crews were picking was merlot, which is more susceptible to freezing than most red wine grapes grown in the Walla Walla Valley. Jimenez works with 14 different vineyards in the Walla Walla Valley and is currently managing 182 acres. He has owned his own field worker company for seven years and has had the same group of people working most of those years. 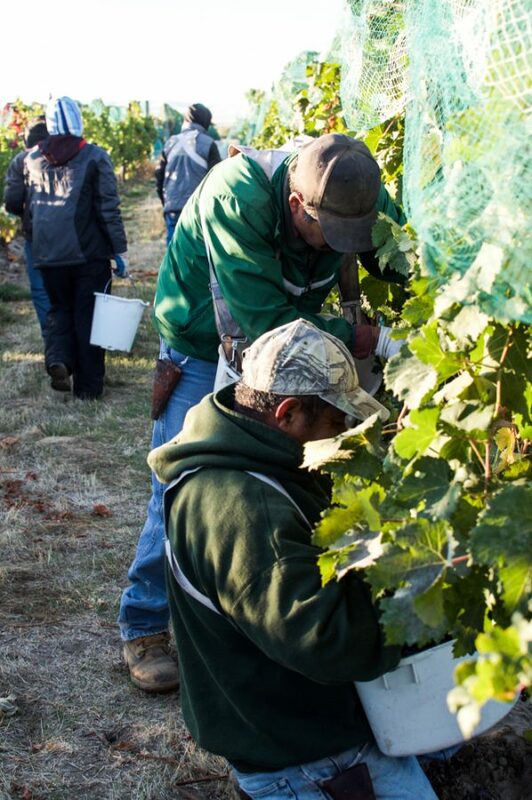 Jimenez’s workers are from Mexico but are established in Walla Walla, and during the cold months between picking and replanting, many of them go back to Mexico to visit their relatives. “They know how we work, so every year they just keep coming back,” Jimenez said. 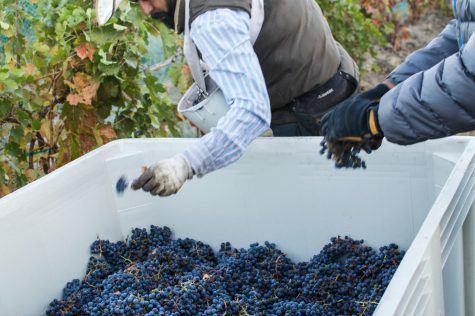 At the same time, the workers’ job is a seasonal one, so it’s hard for vineyard managers like Jimenez to keep his crew all year long because people need to continue working. He added that there is a risk his workers might have to go into winter with no vineyard jobs, but there is a high probability they’ll come back. 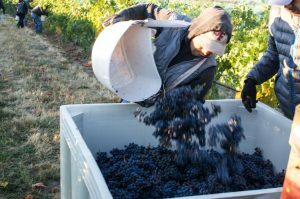 Jimenez provides them with good positions for a long vineyard prep, growing and harvest time in the Valley, and because his workers have been at it for so long, they’ve also cultivated their skill sets. “We’ve been doing this kind of job since 1999. That’s when I planted my first plant,” he said. In 2000, Jimenez went to Walla Walla Community College for a year when it began its enology and viticulture program and has been learning and refining his own expertise ever since. After picking at Bella Fortuna Vineyard from 6:30 a.m. to 8:30 a.m., Jimenez’s crew will move to another vineyard, and then another one, picking until 3:30 p.m. During summer’s vineyard maintenance and nurturing period, his crew starts at 5 a.m. and finishes at 3 p.m. because of the heat. 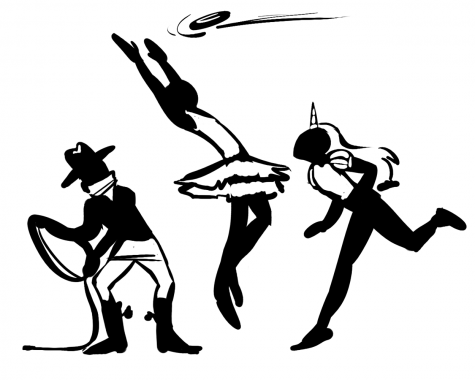 If the weather gets too steamy, sometimes they will call it a day as early as noon, depending upon how they feel. When it reaches 94 degrees, they stop working. It just gets too hot. As for Jimenez himself, his day continues so he can move tools and equipment to the next picking location to prepare for the next day. Despite the long hours, Jimenez says his job is ideal because he loves working outdoors. “Since 1992 when I came to the States I’ve been always working on the fields, so it’s like I feel free,” he said. Norm McKibben, owner of Pepperbridge Winery and a wine and vineyard pioneer in the Valley’s industry, emphasized the importance of the work that the vineyard workers do. “You can ruin high-quality grapes, but you can’t take low-quality and build great wine out of it,” he explained. 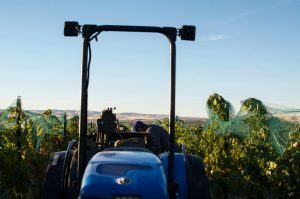 Joel Perez, director of viticulture at Walla Walla Community College, elaborated on why long hours are put into refining vineyards. “If you cannot produce good grapes, not only is your quality of wine going to be diminished, but your ability to maintain a workforce is going to be diminished,” he said. It all starts in February with pruning. McKibben said he helps vineyard managers like Jimenez decide how many grapes to hang per acre, cutting back the canes if necessary to ensure the vines energy is concentrated on producing the desired flavors winemakers seek. 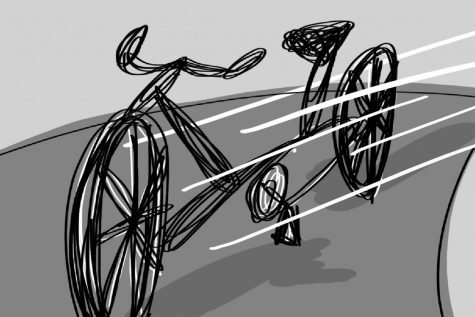 The work has to be done in narrow windows of time and takes a lot of skill. The vineyard workers, as farmers, are also trained in to nurture the new grapes from bud-break through to desired harvest ripeness by monitoring the amount of water and sunlight they receive. Jimenez said that as winter comes the vines harden and go into hibernation. Before the season ends, his crews will be back on the job. Perez emphasized the work that goes on in the vineyards behind-the scenes. “We like to think about the magic of wine happening in a winery, but that’s just the end effect of years of planning in the vineyard,” Perez said. He noted that it takes several years and a lot of money to plant a new vineyard and nurture it to its first marketable crop. Some of those hours are conducted past the typical age of retirement. Jimenez pointed to a man in his crew. “He is 74 years old,” Jimenez said. “And he works so good, I mean his ethics for the job. If I can find 10 people like him, oh god I’ll be super happy. An older woman comes over and dumps a grape she just cut into the bin behind Jimenez’s tractor. The hard labor put into vineyards is the part that most wine consumers don’t see, Perez said. The vineyard workers don’t look for recognition or praise. Good bottles of wine and the wineries that make them get the consumer accolades. But the workers still go strong. For people like Jimenez, a feeling of self-satisfaction propels him through his labors. 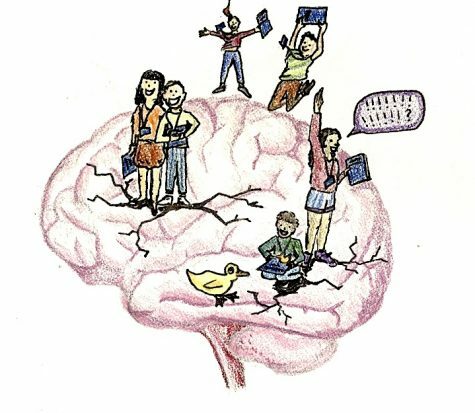 This feature article previously ran in the Union-Bulletin.